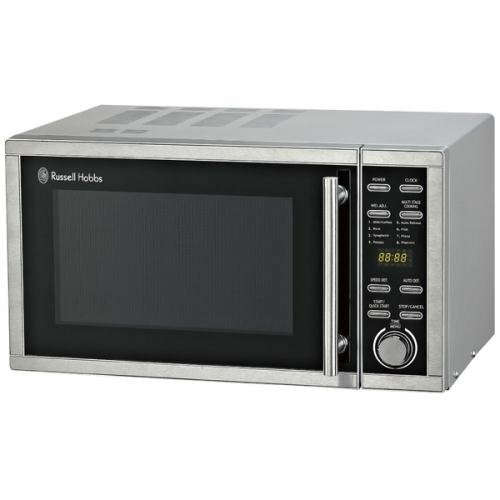 The Russell Hobbs RHM2307 is a mid sized 23 litre solo microwave, with a powerful 900w output, and 5 different power levels. Smart exterior, and decent build quality. It's modern looks may not suit traditional kitchens - asides from that it's great. Finished in a stylish black and silver exterior, the RHM2307 from Russell Hobbs has a decent power output - with 5 different power levels, the highest of which provides 900w of power. This 23 litre solo microwave measures 28.1cm by 48.3cm by 39.8cm, with interior dimensions of 22.0cm by 34.5cm by 32.0cm, and weighing in the region of 12kg. The digital timer and LED display is very easy to read, even in a light kitchen, and the various controls are comprehensively labelled, meaning that we did not have to check the manual during testing. A handy 12/24 hour clock is featured, which many of the RHM2307's competitors do not - ideal if you don't already have a kitchen clock. Overall impressions of this silver microwave were positive - our test team found it performed well, and all agreed it was reasonably priced. The Russell Hobbs RHM2307 offers good value, is easy to operate and works well. If you're after a modern mid sized solo microwave, then it's well worth looking at the Russell Hobbs RHM2307 - it will offer good performance and should prove to be reliable.